I hope that you have something to smile about today. It is suppose to be a rainy day here, but right now, the sun is shining and it is a beautiful spring day. I actually love the rain and the way it smells outside afterwards. I used Laura's Sketch 52 at 2 Sketches 4 You for my card today. When I saw the sketch, I knew I wanted to use my new Give A Hoot cartridge and create some kind of scene in the circle area. I also have seen so many of those fabulous banners on cards that I wanted to use the one on the Give A Hoot cartridge on this card for the word smile. This card did take me a while to create, but I absolutely love the end result. Alphalicious (letters) and George (circle) Cartridges. Thanks for stopping by and leaving me a comment....it makes me smile when I read them. Don't forget about my giveaway...click HERE to check it out. Such a pretty card! I am going to have to check out that Give a Hoot cartridge with my birthday money! :) THanks for sharing! This is an adorable card. Hope you can come visit me sometime soon! we woke up to a frost but the sun is out now too! Soooo cute! I love everything about it! That deer cut is one of my favs! this card is so amazing! Very nice! You have great designs and cards! Oh my goodness this is the sweetest card ever! I love everything about it! you did a great job on this card! very nice. Wowza! This is awesome!! Congrats on making the FAb 5! Darling card! Love the colours and textures. This card is just GORGEOUS, I love it. This is a spectacular card!! I LOVE the scene, the deer is soooooo cute, and the embossing on the tree is very creative. TFS. this is adorable! Love the butterfly on his nose! I just LOVE this card - way cute!!! i found your blog through blue cricket and love it! 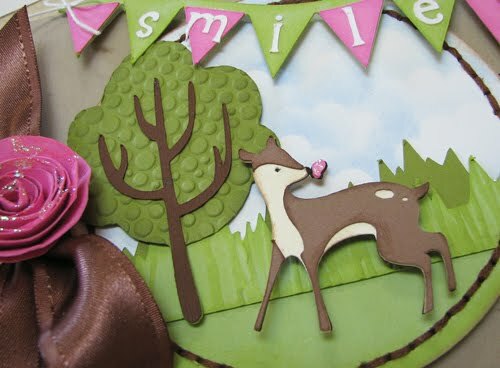 your projects are fabulous and this card is sooo gorgeous! made sure to become a follower too! hugs! Amy your card is sooo`gorgeous` I love your banner,sweet stamp and that flower!!! Thankyou for joining in with us at te Cuttlebug Challenge Blog! !A pleasure to see your wonderful work. Beautiful, Amy!! Just love it!! 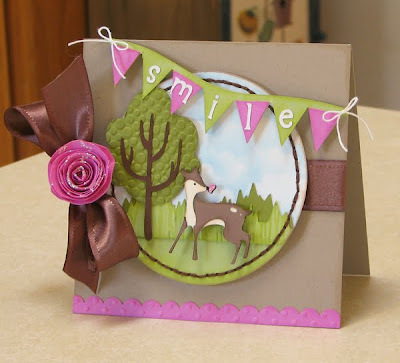 Glad to see you over at Cuttlebug Challenge Blogspot! OMGoodness this is adorable!!! I just love the pennants and your design is fantastic! Amy, Your card id really wonderful! Love the texture on your tree! Lovely card. The scene is so beautiful! Looks like watercolored. This card is stunning and so sweet! Thanks for sharing!